Introducing the Sanum11 to celebrate being YOU on 11th November - an exciting day of self-love and pampering! 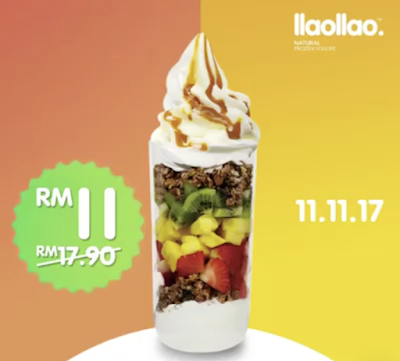 Pick any 2 crunches of your choice to go with Sanum11, a combination of Strawberry, Kiwi, Mango and our deliciously nutty Caja Roja sauce - at only RM11! Available from 10am - 9pm on 11/11/17 at any #myllaollao outlet except Genting Highlands.